Unlocator is Smart DNS Proxy based in Copenhagen, Denmark. The Unlocator was launched in 2013 and over the years it has gained a substantial reputation in this niche and beyond. Basically, it is an innovative technical solution from Linkwork ApS-which is a top-notch IT Company in Denmark. Using the private global DNS network, Unlocator helps you conceal your location as well as the IP address when connected to the internet. For this reason, you get to enjoy unrestricted access to the internet through bypassing firewalls and geographical restrictions in any location across the world. This mostly applies to instances where ultimate privacy or censorship is a major concern. Also, one great feature you’ll love about the Unlocator smart DNS proxy is the fact that you can make it appear as though you are in different locations simultaneously. And if you need to use the DNS on more than one device, there is no limit to the number of devices you can connect at once. May it be your smart Tv, iPad, iPhone, game consoles and any android devices. All you have to do is make sure all the devices are connected to a common internet connection. In addition, the Unlocator DNS can also be used on public Wi-Fi as well as mobile connections like hotspots. However, in this case, you will use the smart VPN feature especially in cases where the custom DNS setting can be a little daunting to configure. This is because in some cases the Internet Service Providers may block the Smart DNS system. The best thing about Unlocator DNS service is that it doesn’t require any knowledge base along with some FAQs to set up. No tech skills are required at all for the setup. And what’s more? The company offers a free 7-day trial without having to add your credit card details. Generally, Unlocator is a great choice for a SmartDNS service. However, most of its users say that Unlocator doesn’t give you complete reliability to the online privacy solutions. All in all, if you just need it for downloads and streaming entertainment, it is one of the most pocket-friendly and quality offering. This is because the DNS proxy makes up for its lack of online security with a long list of ready content that it can unlock. On the other hand, the SmartVPN is a great addition for anyone who has their SmartDNS blocked. Users of this DNS service recommend that Unlocator is pretty much only suitable for people who have ultimately low internet speeds and needs to preserve much of their bandwidth. More to that, most users also love the great hardware compatibility that this DNS proxy relays. However, quite a good number seem disappointed with the fact that Unlocator can no longer give users access to Netflix Us version like it used to in the past. When compared to most of the DNS service platforms on the market today, Unlocator stands a chance of being the easiest among them all. For anyone who is not tech-savvy, the installation process takes only a couple of minutes. This is because Unlocator provides detailed installation procedure for every operating system it is compatible with. After installing the Unlocator DNS on your device you will get access to its easy and straightforward interface. It features calming blue and gray colors combination like the good old program for Windows. It’s easy to navigate through and features are easily accessible. All in all, you need to understand that you need an API key for the app to work effectively. With the Unlocator, you get to choose the websites you’d like to access, the regions you want to connect to and how often the IP address should change. The server can switch between the different server at intervals of 15,30,120,180, 360 etc. minutes automatically. All in all, you can still change the IP address to something you prefer anytime you need to. Unlike most DNS services, Unlocator doesn’t give you an app. What you get is access to their servers across the world which enable you to reroute any connections made by your computer. Most or almost all network Unlocator VPNs doesn’t give individual users a chance to nominate certain specific servers. You only need to use their servers when using the internet. The Unlocator DNS majorly focuses on removing the geographical barriers hence providing its users with high-end entertainment services. For that reason, Unlocator has its servers available in more than 30 countries across the world. In that; Unlocator has its servers spread all over across Sweden, Canada, France, Brazil, UK, Ireland, Germany, Norway, Denmark, the Middle East among other places. There is no distinct number of the number of servers Unlocator has. All in all, a test run to determine the scope of Unlocator accessed most of the services across different continents. Some of them include; HBO, Extra, NBC and much more. The Smart DNS service is reliable and flexible enough to provide you with a SmartVPN. This helps you to access restricted content especially in places where they don’t allow you to change your DNS settings like in Hotels and Airports. The service unlocks vast content and this is what makes it distinct from other DNS services. This far, the DNS service has managed to unlock over 219 channels. Some of the big names include; Amazon, Hulu, Bein Sports, Comedy Central, CBS and so much more. This brings in more fun and diversity to your entertainment world. Unlocator comes with two very diverse configuration options. In that, you can configure the Unlocator like a standard SmartDNS or by building it as a VPN connection. The SmartDNS needs you to put the server address of the DNS in to your network settings. However, it’s important that you understand the use of VPN doesn’t mask your IP address or even change it. All in all, it helps you get around most places while on the SmartDNS services. Both of the configuration options have been tested over and over and in both cases, there is no distinct difference on the effect of internet speed. In short, the service only provides you with the SmartDNS services but the internet speeds solely rely on your internet connection. The Unlocator DNS has more than once been taken through Download speed tests by experts. The results confirm that Unlocator is one of the most reliable DNS proxies with high end performance levels. Therefore, users are guaranteed of high download speeds especially when the DNS service is interlinked with your wireless router. The average download speed is 49.94Mpbs. The main purpose of Unlocator is giving you a hassle free time with downloads as well as an effortless stream of your favorite shows. Unlocator is a dedicated DNS proxy that works to provide the best possible speeds. In this case, Unlocator doesn’t overburden your internet connection when putting in comparison with other regular VPN service providers. The Unlocator is one of a kind DNS proxy that most people look up to when it comes to compatibility with different devices. This is because it is compatible with just any device as long as it has a connection to the internet. In this case, it can be downloaded to any device that is either Mac, Android, Windows, iOS-based or any of the Ubuntu devices. More to that, it is also compatible with Smart TVs, Media players, consoles as well as routers. Also, Xbox 360, PS3, PS4, PS Vita and Nintendo Wii all work well with the Unlocator DNS service. this is one thing you will definitely love about the Unlocator DNS proxy. You don’t necessarily need a smartphone so that your device can run the Unlocator software. And this is one of the greatest advantages that come with Unlocator DNS proxy. It will not only help you bypass the geographical restrictions in some websites but also allows you to use it on basically any smart device you own. And the best thing is that a single package subscription can cover all your devices simultaneously as long as they are sued from the same location. Unlocator is one of the most popular DNS proxy that has been used by so many people over the past years. The Unlocator DNS can be used to override the geographic blocks that you are likely to encounter online while trying to access some web pages. These blocks often keep you locked out hence you can’t watch videos and stream movies. In recent times, Unlocator has been trying to find its way through the Netflix setups. However, it has been quite an uphill task. We have been interested in knowing whether Unlocator can give its users access to the Netflix US version. Unfortunately, our tests turned out that Unlocator is one of the latest DNS proxies that has been completely banned by Netflix. Netflix has been on a merciless crusade against the VPNs and DNS proxies. Therefore, they are trying to do away with the whole idea of unlocking the geo-restricted content from the different regions in the world. It’s always easy for Netflix or any other site to block out these DNS servers. Your location may be altered when using a DNS proxy since your server’s location and information can still be identified by Netflix. Also, unlike a VPN that ensures connections are encrypted, a DNS proxy leaves connections as unencrypted. In that case, it’s possible for your information to be exposed to Netflix because the DNS only works to conceal the physical locations. Therefore, any attempts of the Unlocator users to access Netflix are now welcomed by a proxy error. However, this is not like the end of times for Netflix users living abroad. There are still so many VPNs and DNS that are still in business. All in all, its recommended that you choose VPNs over DNS since the latter is much easier for Netflix to block. The VPNs on the other side always take more sophisticated actions to bypass the proxy errors. In that case, VPNs guarantee you of more private connections since they will hide your web activities from law enforcement teams and hackers among others. And the best part is that most of the VPNs are actually legal in most of the countries. There is not much known about the Unlocator protocols and encryption. However, most people who have had an interaction with their support team can confirm that Unlocator uses PPTP as well as L2TP. However, these two protocols don’t prove to be safe enough for data protection while on the internet. All in all, the two protocols perform incredibly well when it comes to bypassing geographical barriers and unblocking. With the addition of tunneling protocols to their services might enhance the privacy of the subscribers more. Unlocator is an amazing DNS service provider that helps you stream videos despite your location. This DNS proxy has helped so many people to bypass those geographical barriers hence diversifying their streaming experience. However, the question here is; Is Unlocator legal? All the geographical bypassing business seems like pretty serious spying so you can’t help but question the legality of its existence. However, the answer is yes. Unlocator is a legal DNS proxy that belongs to the Linkwork ApS which is a high-end company based in Denmark. The company has a regular register number, therefore the platform itself too is legal and is available for use by anyone who wishes. The Logging Policy – Is It Safe? Unlocator is subject to the European Data Retention Policy. And for that reason, this makes the Unlocator logging policy a matter of concern. After doing some extensive research on the same, we came to realize that Unlocator logs this information for billing as well as quality delivery of services. Some of these details include; Credit card information as well as email id. This is conducted in order to maintain a generic activity report of all the users of Unlocator. However, they don’t share this sensitive information with anyone. The reports are only stored for a maximum of 24 hours. This is only kept for scrutiny to ensure that the subscribers comply with the terms of service the merchant has set in place. Normally, a DNS is used to encrypt any data(package) that leaves your computer. The encryption process mainly focuses on masking the source address as well as the destination address of the package. Therefore, now that the routing information is encrypted the internet routers lack the capability to read it. And for this reason, most of the data can go anywhere in the world as long as you are on a DNS proxy. The Unlocator DNS is available across all continents in the world except Antarctica. Therefore, you can choose any other location comfortably ranging from; Belgium, South Korea, South Africa among other countries. In this case, the Unlocator doesn’t only mask your IP address but can also change the masked IP address. You get to choose how often the IP address needs to be changed. In addition to that, the VPN software allocates you only with a Fake Internet Protocol address. Today, regularly known as the IP address. The VPN creates a certain level of privacy and security while connected to the internet. This is because it can be a little tricky snooping around a computer when no one has an idea the traffic is related to your computer or what is headed for it. More on the privacy and security policies of Unlocator is that it uses the Layer 2 Tunnelling Protocol. This protects any transmissions made from the iOS devices to Mac OS as well as the Point-to-point Tunnelling Protocol methods which are suitable for Windows and Android devices. In this case, the OpenVPN is used for encryption. Since the company has a strict no logs policy, you are assured that they don’t keep any traces of your online activities, not at all. This is because of it is a method that provides much more security than the PPTP than L2TP. Unlocator keeps your private information safe, especially when making payments. They accept iDeal, Sofort, BitCoin all of which work as reliable mediators. They do not provide Unlocator-the merchant with bank card number or any other personal information. The support system of a company is very crucial to the users. It helps the users through some of the common glitches they are likely to encounter when using their services. And when it comes to Unlocator, their support system never disappoints. When you access their website, you will find a fully comprehensive support page. Through this page, you will get access to information on troubleshooting tips as well as articles on set up guides. More to that, the page also familiarizes you with some of the Frequently Asked Questions about the Unlocator DNS Proxy. The FAQ section covers some of the common problems users are likely to encounter when using their services. In line with the support page, Unlocator also has a team of support staff who can be contacted directly in case there is anything that needs further clarification. This is a dedicated team that ensures they suffice all your questions in the most satisfactory way. The better percentage of the customers have been constantly impressed with the high-end professionalism and reliability they display. The best thing about the Unlocator support team is that they can be contacted in diverse options. One of the commonest ways is sending an email after filling out a form that’s available on the Unlocator website. Unlocator comes with 3 paid plans and one free-7 Day Trial. There is always something to love about packages that come with a free trial plan first. This is because you get an opportunity to use and see how well the app fits your needs without any limitations for 7 days. This gives you the chance to decide whether or not you’d like to upgrade to the paid plan. For the paid plans, the company offers three diverse subscriptions. These include; the monthly, 6-month and yearly plans. The monthly subscription goes for $4.95 while the 6-month one goes for $27.50. in addition, the yearly Unlocator plan goes for $49.95. All in all, the three packages offer similar benefits where users get to enjoy Smart VPN, Unlocator Servers and no limitations to the devices you choose to cover. Also, all the packages include a money back guarantee within 14 days if you are not satisfied with the services provided to you. The Unlocator DNS service comes with a wide array of payment methods. It accepts payments from most or all of the leading credit cards. If you are a subscriber at Unlocator, you can make your payments through Express, Discover, JCB, Visa, and MasterCard. There is one very distinct thing about Unlocator, the fact that it accepts payments through Bitcoins too. This is different from other merchants since most of them don’t accept anonymous payments. For that reason, if you need to keep your identity entirely undercover, Unlocator is all you need. Every consumer loves to hear about the money back guarantee when they purchase something. It gives someone that sense of security just in case what they buy falls short of their expectation. I know you might be wondering why most people will seek comfort in this policy but at the end of the day, some of the businesses tend to promise things they don’t actually offer. For that reason, you are entitled to getting your money back if the merchant doesn’t fulfill what they promised. And just like any other vendors, most VPN and DNS providers are a victim of this too. However, Unlocator is one of the few that have learned to keep their promise when you initiate a refund. The company offers a 14-days money back guarantee if you are not satisfied with the services they offer. This is 14 days from the date you signed the agreement with the merchant. If you withdraw the services within the stipulated 14 days’ window, you get refunds for your money but still keep a certain amount depending on your total time of usage. Unlike most of the DNS services, Unlocator offers its users with a free 7-day trial. This allows any potential users to test the Unlocator services before they decide to upgrade and make payments on the paid plans. 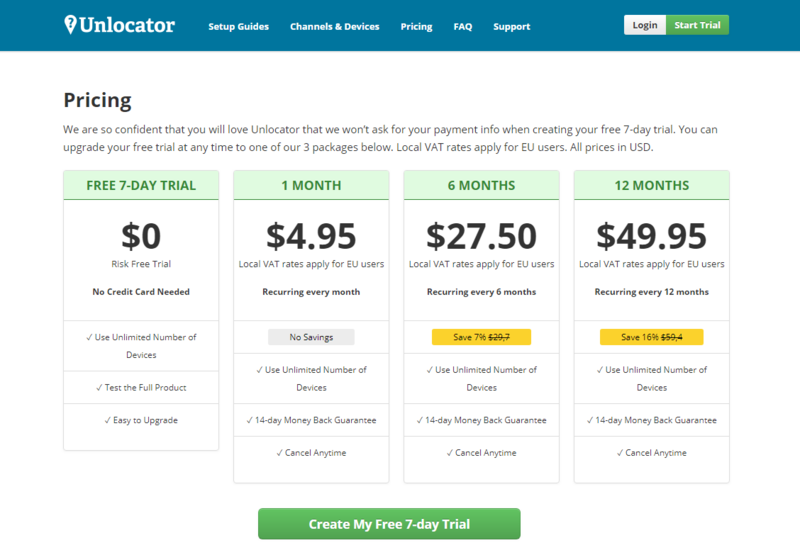 And the best thing about the free trial version of Unlocator is that it doesn’t require any credit card information. 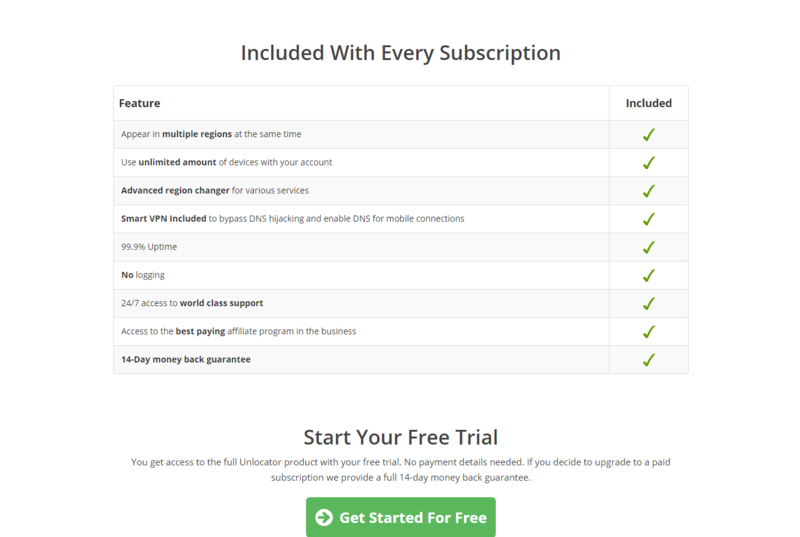 Also, the free trial version provides equal features and services with the paid premium plans. Therefore, you get to experience the full benefits of the paid plan within 7 days. You will definitely love the fact that Unlocator is compatible with any of the devices you have. This ranges from, tablets, MacBook, and smartphones among others. The availability of the 7-day free trial period before deciding to take the paid plans. You actually don’t need to add your credit card details. Unlocator coms with a 14-day money back guarantee if not satisfied with the quality of services they provide. Unlocator is one of the best entertainment DNS services. All in all, it comes with a few shortcomings. One of the most disheartening ones is that it doesn’t unblock Netflix. Netflix is a well-known media service and actually a favorite among most people. This is different from what most people expect because anyone signing up for any DNS service expects to bypass the barriers set on the four major channels for online content streaming. All in all, they unlock Amazon, BBC iPlayer and Hulu nut there is something about Netflix missing in the list. More to that, the Unlocator DNS service doesn’t offer full encryption of the user’s traffic over the internet. All in all, this isn’t much of a big deal since most people prefer this service to stream online. In that case, you need not perform any transaction that may require a higher level of encryption and security. Well, Unlocator is a quality DNS service provider. This is because, besides offering decent customer support to their users, their services work faster and are more reliable than those of VPNs. This is because there is no encryption involved in Unlocator. Also, their services help users to unlock and bypass all geographical restrictions by some websites. However, Unlocator might not be the best choice for anyone. One of the most critical issue with Unlocator is the fact that the DNS service offers no security features for the clients. This SmartDNS lacks in encryption which makes it less reliable. This means that, when using Unlocator, you should not send data across the internet in an unencrypted format. This exposes users to hackers and some governmental agencies like NSA. However, it’s all up to you if you would like to use Unlocator or not. This is in accordance with what this review has to say about their services.